Summer into fall. Long blooming. Average to dry soil. Drought tolerant. Shorter than most native asters making it a useful garden species. 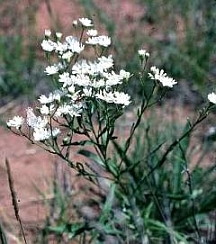 The white provides nice contrast for other later summer flowers. Deadhead if self-sowing is unwanted.